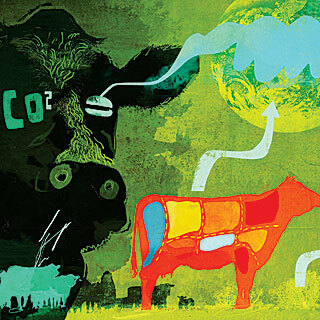 Pound for pound, beef production generates greenhouse gases that contribute more than 13 times as much to global warming as do the gases emitted from producing chicken. For potatoes, the multiplier is 57. Beef consumption is rising rapidly, both as population increases and as people eat more meat. Producing the annual beef diet of the average American emits as much greenhouse gas as a car driven more than 1,800 miles.